Muscat, Oman, 2018. Spectators waiting for the traditional bullfight in Oman. People gathered at the stadium before a tournament. Muscat, Oman, 2018. Men waiting for the traditional bullfight in Oman. People in traditional clothes discuss news and make bets. Muscat, Oman, 2018. Traditional bet making before the bullfighting in Muscat. Oman en pull sheep as a prize. A wild cow chase participants at the Pamplona's bullring after the first 'encierro' (bull run) of the San Fermin Festival. Pamplona, Spain. A wild cow chase participants at the Pamplona's bullring after the first 'encierro' (bull-run) of the San Fermin Festival. Pamplona, Spain. Bullfight in San Fermin Festival, Pamplona, Spain. Release of bulls that riders must to touch and dodge the attack in the small arena. 1940s: Bull runs around arena. Bull runs fast after cape of bullfighters. Bullfighter waves cape at bull. 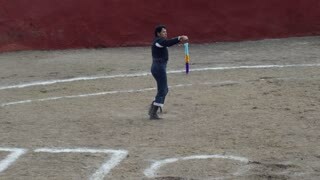 Bullfighter holds banderillas and stabs the bull. Bull runs after man. Bullfighter stabs bull. 1940s: Bullfighters and bull. Bull hits picador’s horse. Picador stabs bull, bullfighter waves cape. Bullfighters stab bull. Bull lays on ground, people enter field of arena, horses pull dead bull. 1940s: Bullfighters fight against bull in crowded arena. Bull lays on ground. Bull fight. Man on horse stands in front of bull, bull hits horse, bullfighter approaches bull with red cape. 1940s: Horses pull dead bull and leave the arena, men sweep arena’s ground. Bull runs around arena, man on horse blocks bull from bullfighter. Bullfighters perform with cape. Bullfighter stabs bull. 1940s: Women prepare flowers on the ground, canal with trajineras. Men on horses at bull fight arena. Bullfighter performs with bull. Man on horse separates bull from man. Bullfighters perform. 1940s: Bullfighter waves red cape in front of bull, bull falls on the ground. Crowded arena. Three bullfighters stand around tired bull and wave red capes. 1940s: Bullfighter waves red cape at bull. Bull lays on the ground, horses pull dead bull. Bullfighter throws cape into audience. Bullfighter greets audience. Bull runs after bullfighter’s cape. 1940s: Bullfighter holds hat and greets the audience. Bullfighter performs with red cape, bull runs after cape. Bullfighters waves red cape at bull in crowded arena. LISBON, circa 2017 - POV gimbal shot of the Campo Pequeno Bullring - Praca de Touros do Campo Pequeno - a major bullfight arena in Lisbon, Portugal and opened in 1892.